Two weeks ago, I broke one of my favorite bowls that I got in Dubai as a souvenir. I was so depressed when I did it, but soon after I remembered that my mom might be able to fix it. I brought these pieces to her place and then the bowl has come back to me like this. Can you see the gold lines? This is kintsugi (golden joinery), a Japanese traditional way to fix ceramics. First, connect the broken pieces using lacquer, leave it until it’s dried, then decorate the lines with gold or silver. 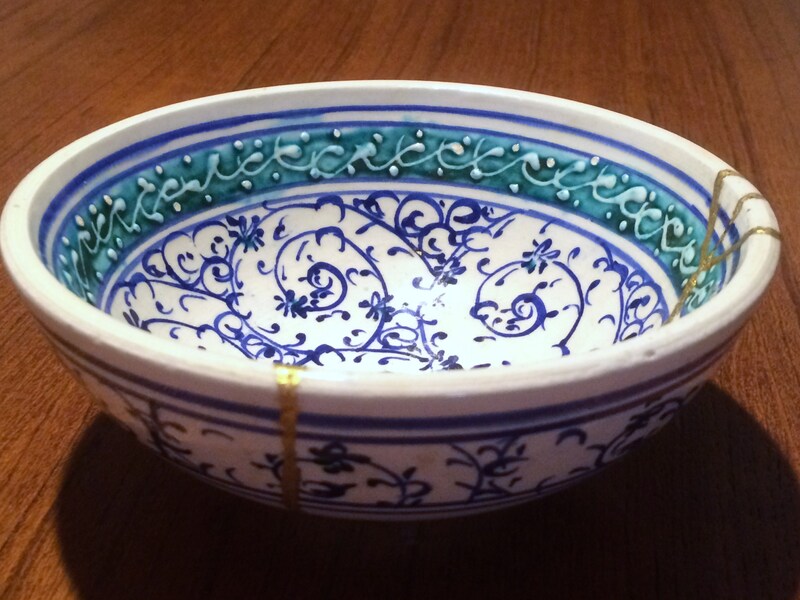 The connected lines are called keshiki (scenery), meaning that the ceramic has a new look. Whenever I visit the Japanese restaurants abroad, I get surprised to see how expensive their miso soup is. In fact, making miso soup is not difficult at all, if you can get miso paste. A typical Japanese home meal consists of a bowl of steamed rice, a bowl of miso soup and side dishes. We don’t eat sushi everyday. Apart from the fact that it’s indispensable when you prepare Japanese food, miso soup has lots of benefit as below. Quick to make: You just need 10-15 minutes for preparation unless you make very complexed ones. Flexible and creative: Most ingredients go well with miso taste. You can arrange it in many various ways. Economical and eco-friendly: You can use what’s left in the fridge. Healthy: It has various effects such as warming your body, improving the enteral environment and having antioxidative effect. So you want to make it now? Here’s how to. 1) Boil water (dashi soup) in a pot. Cut any ingredients you like into bite-size pieces and add them in the pot. While cooking, skim off the scum on the surface. * I recommend to use dashi stock when you use vegetables with light taste. If you don’t have dashi stock, use mushroom, seafood and/or meat, then it will give miso soup rich taste without dashi. 2) After the ingredients are boiled, and turn the stove off to add miso paste. (The average amount is 1 tbsp per 1 cup, but make sure to check its taste by yourself. First put a small amount and then gradually increase it until it tastes well.) Turn on the stove again to heat it for a short while before serving. Just 3 Items Will Make You a Japanese Cook! In December 2013, washoku (traditional Japanese cuisine) was added to UNESCO’s Intangible Cultural Heritage list. It is great that many people in the world come to love Japanese food, but it’s not really easy to find tasty and reasonable washoku outside Japan. Japanese food is not so mysterious as you imagine. In fact, Japanese home meals are quite easy to make. You just need to buy 3 items to start Japanese cooking. Japanese home meals can be cooked in flexible ways, so most of the ingredients can be replaced with what can be found in other countries. However, the following three items are indispensable to make Japanese food. You can easily find them in every grocery store in Japan. Outside Japan, check out Japanese grocery store or online stores. 1. Japanese rice: Steamed rice is a main part of our daily meals, although bread has become popular for breakfast. Generally, a bowl of rice is served per person for every meal, which can be refilled later on as okawari. Make sure to buy Japanese ordinary rice (uruchimai), because its stickiness cannot be found in other kinds of rice. You don’t have a rice cooker? No worries, see this article. 2. Soy sauce (shoyu): Soy sauce is versatile! It can be used for western dishes too, so don’t hesitate to buy a bottle. Simply dip any vegetables, meat or fish in it, then it will taste Japanese. Not only as dip sauce, it is used to season many Japanese traditional dishes. If you want to pursue Japanese cooking, consider getting the following items that will increase the variety of dishes. Dashi: Dashi means soup, stock or broth. If you prefer home-made dashi, you will need to prepare katsuobushi (dried bonito), konbu (dried kelp), niboshi (dried infant sardines) and/or hoshi-shiitake (dried mushroom). If you want to save time, instant dashi is convenient. It’s powdery or condensed liquid, and will be mixed with water to use. Sake: Sake (rice wine) is used to get rid of smell of fresh food and add rich flavor. Mirin: Mirin is sweet cooking rice wine. It is used to add sweet flavor and create shiny texture.